For you fitness foodies who are reading this, you know how hard it is to dine out locally and still stay on track with your diet and fitness goals. Well, I just discovered a few weeks ago a place that opened up right here in our neighborhood, Bear Flag Fish Company. Although it’s not that new (opened its first location in 2007), it’s new to Newport Coast (Crystal Cove Promenade). Bear Flag Fish Co. claims to have “the Freshest Fish Tacos in Orange County”. 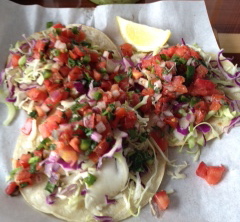 Their tacos are UH-MAZING… with your choice of fish, tommy sauce, pico de gallo and fresh cabbage. I just can’t get enough of these fish tacos. Other noteworthy and popular items are their Bear Flag Burrito, grilled seafood plates, and a variety of specialty sushi rolls. And if you really want to keep it lean or your on a high-protein type of diet, the ahi poke salad is to-die-for! Beware of the chips and guacamole… they taste so good, it’s hard to stop at just a couple. Don’t even order them unless it’s your “cheat day”! Tell me where your favorite healthy place is to eat in Orange County! 2 Comments on "The Healthiest Place to Eat in Newport Coast"
Blackened halibut burrito, no rice. Sooooo good!!! Manager told me they’ll be getting whole wheat tortilla’s soon. Yummy!!! That sounds delicious! I’ll have to try that one! Are You Drinking this Daily Yet? Nicolette said "Yummy!!! That sounds delicious! I'll have to try that one! ..."
Gloria said "Blackened halibut burrito, no rice. Sooooo good!!! Manager told me t ..."
Nicolette said "There are a couple of reasons why you should not do this cleanse, or a ..."
Ayse said "Can a breast-feeding mom do this cleanse? Where can one find these pro ..."
Megan Alderson said "I have been in the wellness business for almost 11 years. I know all t ..."
CLICK HERE Join us on the Daily Plate for diet and nutrition support. See the results we have achieved for our clients over and over again.